Ages 7 through 11. 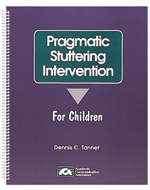 This practical stuttering intervention program focuses on the child's fluency, attitudes, feelings, and his/her effectiveness in the pragmatic aspects of communication. The activities provide opportunities for children to practice speaking fluently as they tell stories, answer questions, request information, express opinions, and use language for various other speaking purposes. In this book, Dr. Tanner presents a detailed description of procedures for conducting assessments, providing remediation, and evaluating progress. The revised edition includes many new activities, strategies for using classroom curriculum materials to build fluency, guidelines for working with parents, and more. To reduce the anxiety and negative emotions that have come to be associated with speech.